Rogan & Co | Can Men Cook? Let’s not beat around the bush. We just had a fabulous lunch. It finished at quarter to four. Sybaritic in the extreme. And my last blog said I was a bit worried about the whole same old same old in this part of the lakes – and with South East pricing – and now I will take that back. Let’s start at the end. We went for a postprandial walk. 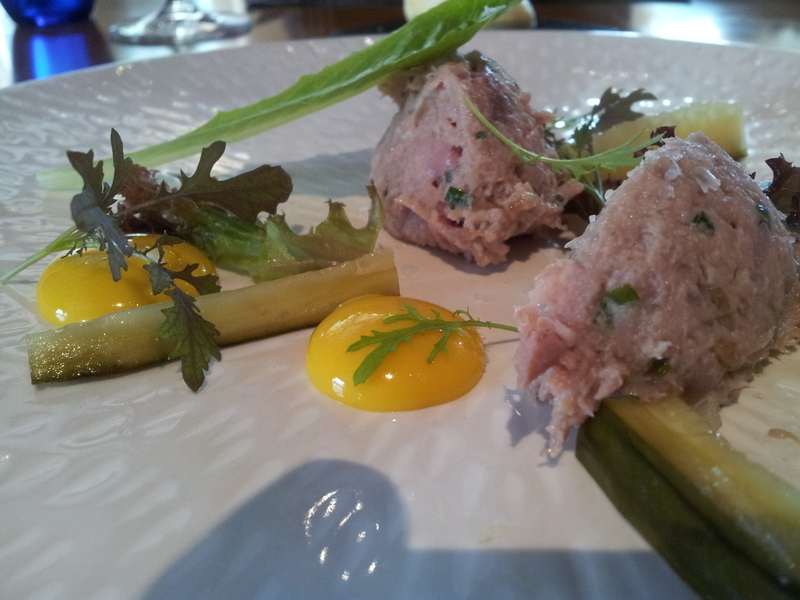 We went around to the sister restaurant of Rogan & Co – L’Enclume. And today, I see in the news, that The Good Food Guide has named it as restaurant of the year – beating Heston Blomenthal’s Fat Duck into second place! The chef Simon Rogan is committed to Nature not Science. 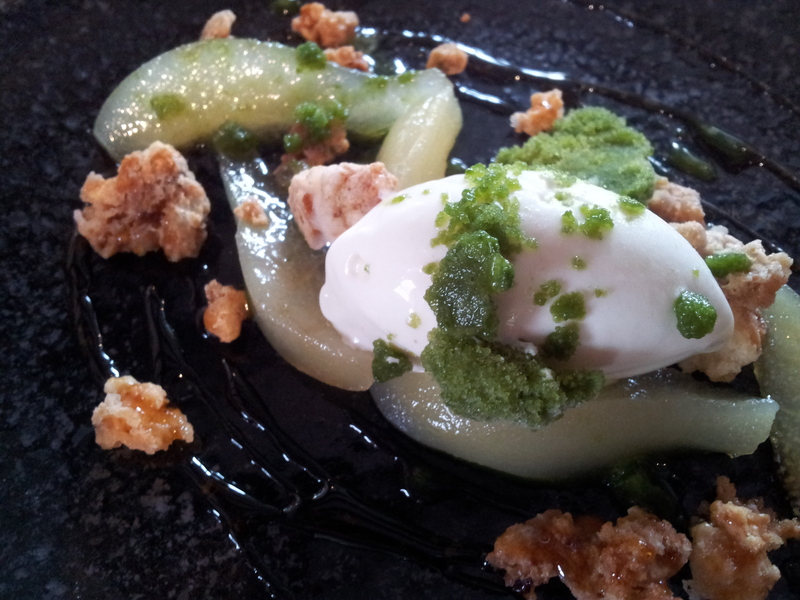 This is the top end stuff – 20 course tasting menu and the like. We saw a delivery in the back of a car. 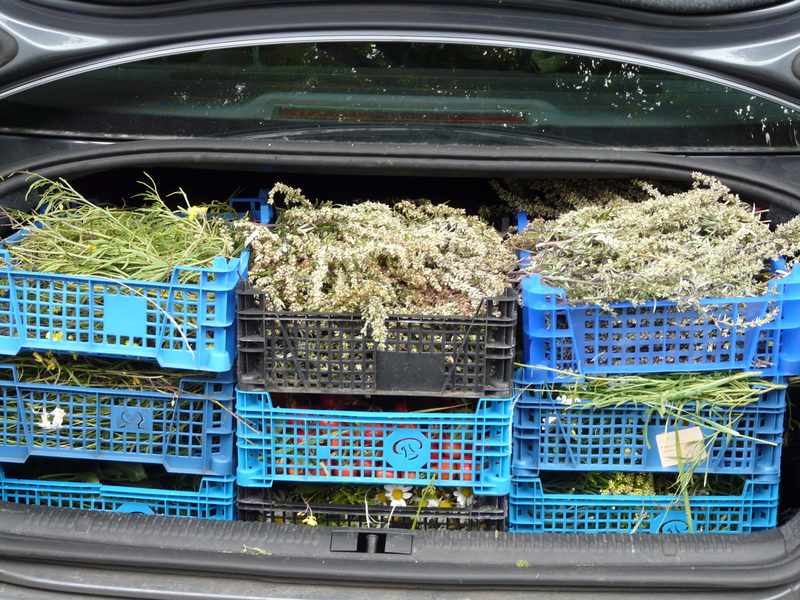 Went and chatted to the two guys there – and found we were talking to the head of front of house – and the restaurants very own Forager! (Sorry guys – didn’t write your names down – but you know who you are!) Just food lovers who were deeply excited by local, excellent ingredients. They have started their own smallholding (plants only – no animals as yet). And there was something else special. They wanted to chat because we were interested in food too. It was an attitude that everyone could be a potential customer, so why not be nice to everyone? Many organisations could copy this simple idea. Anyway, it is a much nicer way to live and be, isn’t it? 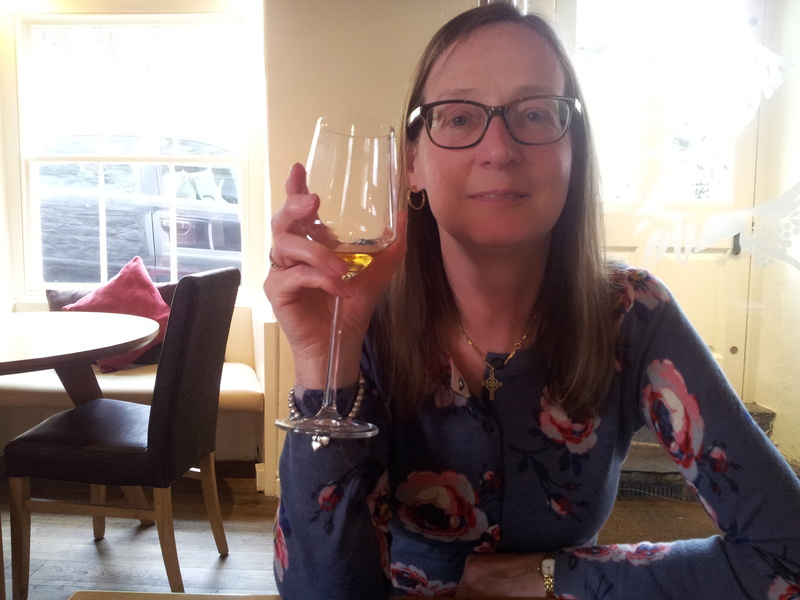 Lovely Janie – happy at the end of our meal! So, Rogan and Co was the place we had our lunch at. 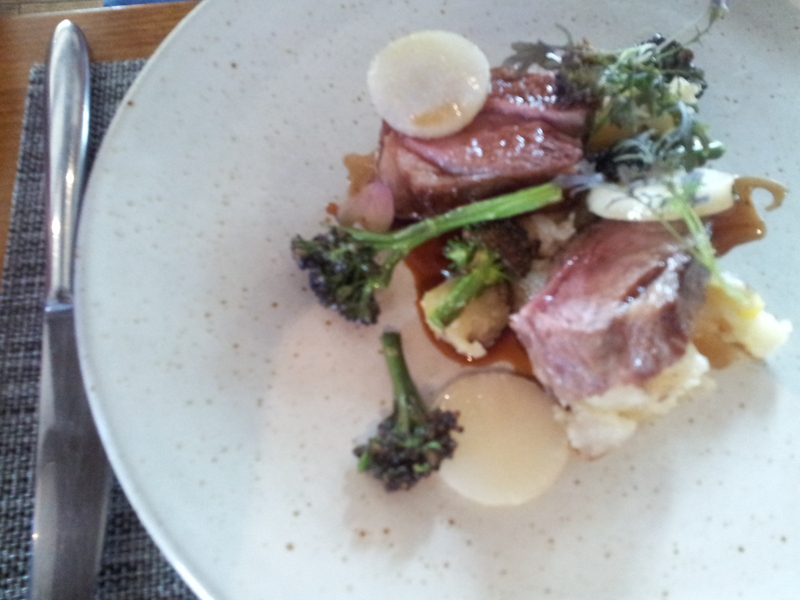 The sister restaurant – not cafe style (Like both Raymond Blanc and Jamie Oliver have done). It felt more (very high end) table d’hôte, to the L’Enclume’s multi-Michelin starred extravaganza. Continuing with the backwards theme – we start with the end! Coffee was silky, strong, not bitter and served with fluffy hot milk – oh, and stunning home made little doughnuts served with apple puree, and a tiny salted caramel chocolate confection. Puds? Yes, you had to, even though I know what we had had before. I had a poached pear. Jane had toffee apple. Sorry, this undersells both confections. Just look at the piccies. And we did have stickies with them – a pudding wine. 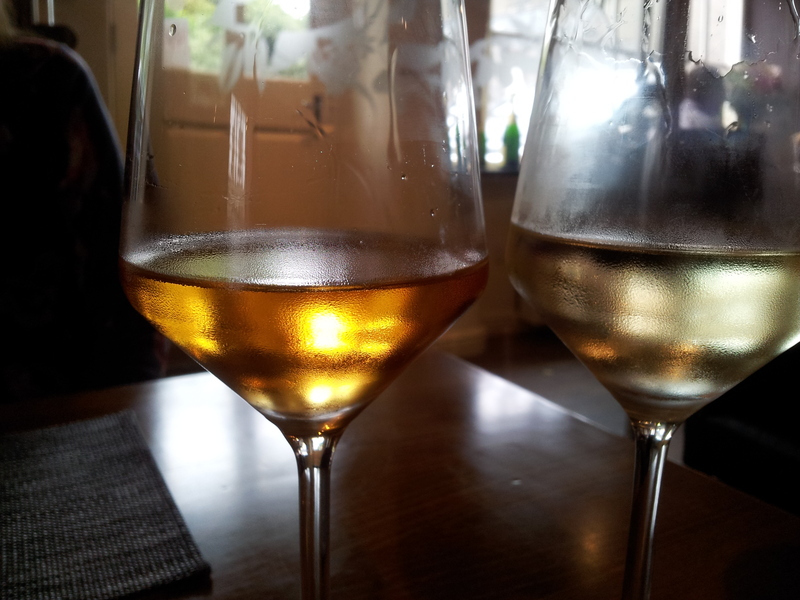 We chose one – and were offered another to try (gratis – thank you). Golden, fragrant beautifully matched to each pud. Wow. Jane’s was like gorgeously wet toffee, which just made the apple sing. 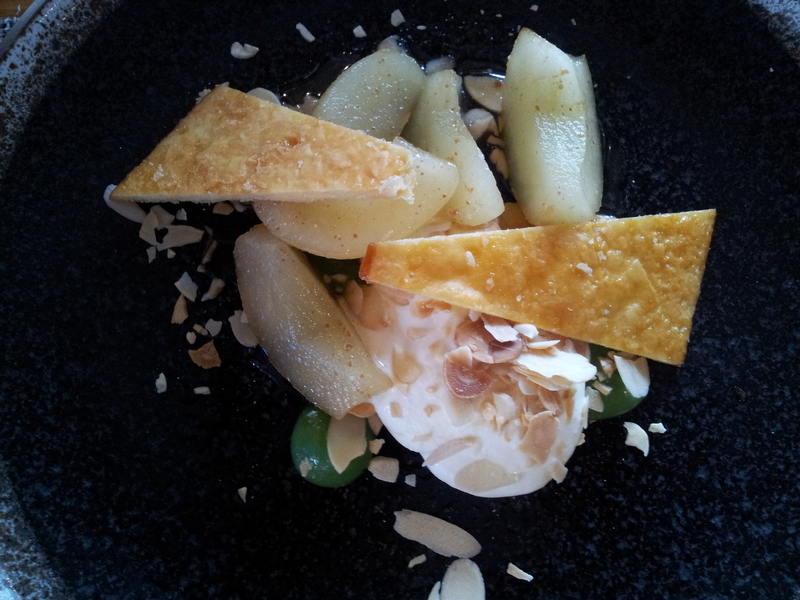 And my zesty, lime with lemon driven Chenin Blanc from Thailand (I kid you not) just did the same for my pud. Look, I know puds are bad, and naughty and and and…but, but, but this was our 29th wedding anniversary – OK? Mains driven by the meat. Lakes bred lamb. Very local pork belly. Hugely concentrated reductions (Gravy would be madly understating the fragrant sauces – and sauce is still too large a word). Look, lets just say it went very quiet. I tried the lamb. It was a melt in the mouth explosion of powerful flavour that reminded you that that sheep had not lived in vain. 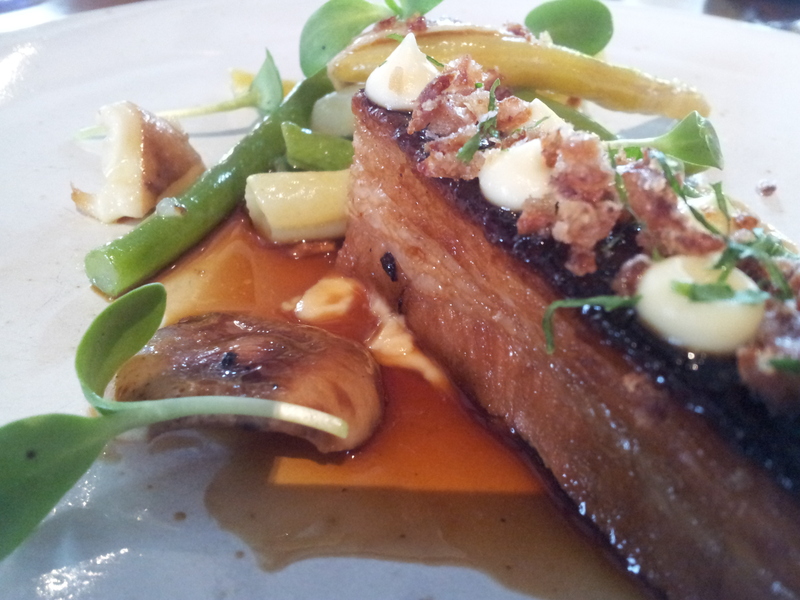 The pork was just as good The sauce, morels, tangy crunchy seasonal veg – were all as good as it. 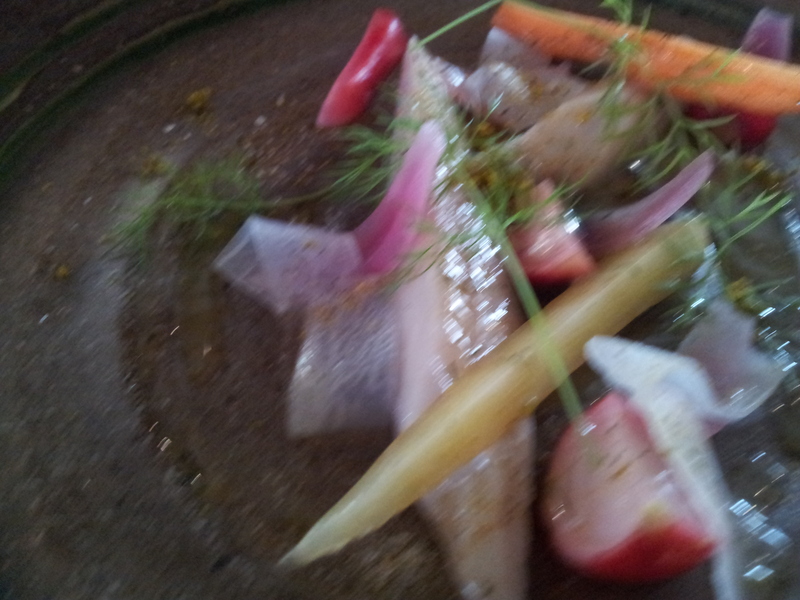 We started madly with soused herring and duck rillettes. Again, we had the usual excitement of matching pieces – like meat (or fish) and 7 veg…photos from a phone, but I hope you get a feel for the place. 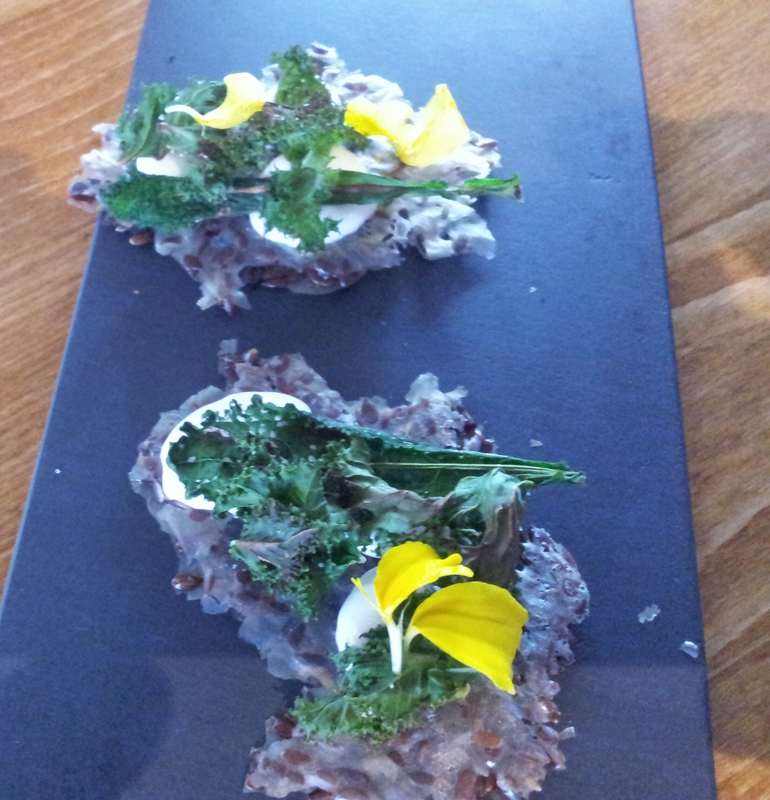 As you would expect – an amuse bouche to start – a fennel crisp, with a stunning goats cheese quenelle. We started by feeling a bit apprehensive of a new place, which could have been a bit up itself (the main web site was a bit scary, not enticing to me). But I hope the style of this review has not been backwards in coming forwards. This is a place that knows about food and service and people – and it seems to love them all.